SCP-2852 at a Black-Level event. Special Containment Procedures: Containment of SCP-2852 is to focus on tracking and disruption of incidents, where possible, and general monitoring of SCP-2852 compatible population centers. All individuals involved in Blue-Level and White-Level events are to be monitored extensively, and their identities are to be given to local law enforcement as potential terrorist threats. Even when disrupted, individuals involved in Blue-Level and White-Level events are to be cataloged, and their names are to be sent to local law enforcement agencies. Individuals witnessing the disruption of either event are to be given Class-B amnestics. Black-Level events are to be monitored until conclusion. Afterwards, all participants are to be treated with Class-A amnestics and are otherwise treated identically to those affected by other events. Members of Mobile Task Forces Upsilon-36, Upsilon-52, and Upsilon-99 who witness a Black-Level event are to be treated with Class-A amnestics upon retirement or transfer and are to be monitored for any signs of antisocial or otherwise uncharacteristic behavior. If found to have been infected by the Black-Level event, operatives are to be amnesticized, suspended from all field operations, and redesignated to low-level, low-intensity work, i.e. maintenance and data input. MTF Y-36 “Party Crashers” are tasked with responding to any SCP-2852 appearance. MTFs Y-52 “Cater Duty” and Y-99 “Altar Boys” are tasked to identify SCP-2852 events and provide backup to MTF Y-36 as needed. MTFs Y-52 and Y-99 are to establish presence within communities where 60% of the population is Roman Catholic or (as of Revision 2852-7) Anglican. Any SCP-2852 instance found attached to a different religious group must be reported to a researcher with Level 4/2852 clearance immediately. While currently isolated to the North American subcontinent, all SCP-2852 compatible communities are to be monitored for an uncharacteristic rise in juvenile delinquency, sterility, domestic violence, and divorce rates. Description: Instances of SCP-2852 have the appearance of a middle-aged white male. Biologically, the cells of SCP-2852 instances are genetically identical and human; however, instances do not have any identifiable organs. Their bodies are made up of fibrous muscular tissue, with the teeth and hair being made out of chitin chemically similar to those of the Cicadidae family. The eyes of SCP-2852 instances, while looking non-anomalous from a distance, are set in the sockets without any nerve connection. While capable of speech despite having no vocal cords or analogous organs, SCP-2852 instances do not show any grasp of language, speaking in a “word salad.” Despite this, all individuals at an SCP-2852 compatible event will perceive the subject as speaking intelligibly and will regard its actions as normal, unless briefed of its anomalous properties beforehand. Individuals describe SCP-2852 as being playful with a crude sense of humor, and all individuals affected in an SCP-2852 event will refer to the subject as “Cousin Johnny.” While sentient, SCP-2852 instances do not appear sapient. SCP-2852 instances appear at various Catholic and Anglican religious functions and are treated as being an established member of the family. Instances of SCP-2852 are accepted regardless of family resemblance or ethnicity. The entity appears at baptisms, weddings, and funerals, referred to as Blue-Level, White-Level, and Black-Level events, respectively. 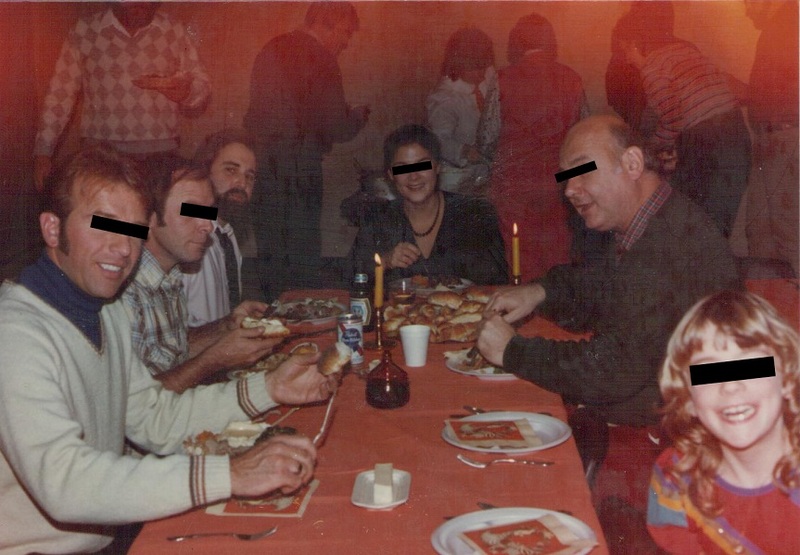 Currently, no SCP-2852 instance has been found to appear at any other family gathering. All attempts at tracking SCP-2852 instances before and after an event have met with failure. The entities are able to appear at such events as though they had always been there, alternately appearing between frames when under surveillance or simply evading any attempt by operatives to keep them out of an event. All tracking devices placed on SCP-2852 instances have malfunctioned immediately, with the entity evading any surveillance. Each family gathering that SCP-2852 attends result in different behavior from the subject and different effects. Generally, the effects of SCP-2852 appearing at a family gathering result in more serious damage done to children, although adults are not free from its effects. It is worth noting that stopping an SCP-2852 instance before it involves itself in the religious ritual will not stop its effects from spreading, although they may be diluted. The appearance of SCP-2852 at an event is enough for its effects to start spreading among the family. When questioned after an event, all affected individuals report a feeling of fondness toward SCP-2852, regardless of its actions during an event. SCP-2852's effects at a Blue-Level event are present more strongly in the child being baptized, its parents, and any godparents chosen for the occasion. During the baptismal ritual, SCP-2852 will involve itself directly in the proceedings, acting as a third godparent when traditionally there are only two, a male and female. Blue-Level events proceed identically, despite the presence of a third godparent, until the child is submerged into the water. Immediately, the child's top layer of skin will slough off in one piece, as though molting. This process does not seem to harm the child in any meaningful way. The godparents will then eat the skin between each other. Afterwards, the mass will go on as normal, and SCP-2852 will exit along with the family. It is of note that SCP-2852 does not appear at any family celebration held after the baptism. The baptized child has a chance of dying within the next six months well above the national average. Living children exhibit multiple Cluster B personality disorders. Most join anti-capitalist groups, various GOIs, or, if unchecked, will engage in destructive behavior usually manifesting in self-harm, abuse of animals, or abuse of small children. Godparents and biological parents will be rendered sterile, regardless of SCP-2852's success in becoming part of the baptismal ritual. Both groups commit suicide within five years of a Blue-Level event, normally through drowning. All individuals not involved in the baptismal ritual are 500% more likely than the national average to have stillbirths. Those who are still capable of having children are far more likely to abandon them, sometimes allowing the child to die in the process. One couple affected by a Blue-Level event in [REDACTED], Ohio gave birth to triplets which they then tore apart and hung from trees around their property. Past adolescence and into adulthood, children exposed to the song of cicadas respond with extreme anxiety and accompanying physical symptoms such as dry mouth, nausea, vomiting, diarrhea, and headaches. Some subjects' agitation escalates into violent outbursts, which have resulted in at least 20 fatalities. When interviewed about the cause of their disturbance, no subjects have ever identified cicada-song as a trigger for their episodes. Even in one interview involving Level V enhanced interrogation, the subject never indicated the role of cicada-song in his attack on [REDACTED] parish, which resulted in 18 dead and 10 wounded, including his parents and three siblings. During the marriage ceremony, SCP-2852 will insert itself as a groomsman, and its most deleterious anomalous effects will only manifest after the vows. After the rings have been exchanged, SCP-2852 will produce various implements that allow the bridesmaids and groomsmen to pull out their teeth one by one. The individuals seem to be oblivious to any pain that would normally take place during such an event, and blood loss, through still unknown means, does not occur. The bride and groom will be presented with the teeth and will eat them. Damage done to the bride and groom's teeth and jaw are extensive, but any blood loss that occurs will not be fatal. The groom will then, in place of vows, vocalize a currently unknown cicada song, which has been known to reach 140 dB (SPL), rendering the bride and those on the altar deaf. Currently, no groom has been deafened by his own call. At the wedding reception, SCP-2852 will take the role of the best man and give a speech. This speech, as all vocalizations of SCP-2852, will be nonsensical with no pattern to the words used. Individuals will react to the speech with mixed emotions, some crying uncontrollably and others falling into hysterical laughter. After the speech, SCP-2852 will produce a gift for the married couple. This gift, currently, has always been 3.5 kg of human hair of various colors, 13 deceased specimen of Tibicen linnei, and 23 human teeth in a cardboard box. DNA testing on all gifts have been inconclusive. The bride and groom of a White-Level event will divorce, on average, two years after their wedding, usually as the result of domestic violence. Any children produced during their marriage will have Cluster B personality disorders or life-threatening disfigurements. All married individuals attending the event will find themselves unable to have children, despite a lack of detectable changes to fertility-related biology. Sperm counts and sperm quality remain unaffected. Ovulation also remains unchanged, and no genetic irregularities have been observed in eggs. The Foundation has arranged a statistically significant number of hysterectomies for guests at White-Level events. The surgeries are prescribed and administered by third-party agents in the medical industry. Exhaustive biopsies, chemical analyses, and mechanical inspections of the extracted uteri and ovaries have failed to yield any signs of abnormality. All children involved in a White-Level event will avoid romantic relationships, and nine out of ten commit suicide by the age of 18. Roughly half pull out their teeth until blood completely blocks the airways, and the others bite their own wrists until exsanguinated. Black-Level events are notable in that any attempt to disrupt the event, through any means, result in the actor becoming a participant in the event. Currently, there exists no way to stop or end a Black-Level event. Any attempts at barring SCP-2852 instances from the church or funeral home result in SCP-2852 simply appearing in a pew. During a Black-Level event, SCP-2852 will take the place of the eulogizer, even if one was not scheduled to speak during the mass. The speech, as any vocalization by SCP-2852, will be nonsensical, with no patterns being found. However, as the subject speaks, the individual closest to the departed will open the casket and produce a long knife. The knives produced during a Black-Level event are not seen before the event and disappear after the event. The individual will then exsanguinate themselves, normally from the wrists, but there have been instances where individuals have slit their throats. In turn, two by two, each attendant will use the knife to pour their blood into the casket. Children too young to exsanguinate themselves are helped by adults. Despite many losing enough blood to result in death, no physical effects are seen in the participants. SCP-2852's speech eventually turns into the song of an adult male Tibicen linnei. All participants will respond with the same call, despite the song of the cicada being limited to the male. SCP-2852 will stand at the pulpit until each individual has bled themselves and then will walk to the casket and vomit a mixture of blood, wood pulp, and dead specimen of Tibicen linnei. It is currently unknown how SCP-2852 instances are able to hold the mixture within themselves, due to the lack of any cavity of sufficient size in its body. Once finished, the funeral mass will go on as normal, and the casket, filled with blood and SCP-2852's vomit, will be taken to the cemetery and lowered into the earth as is normal for a Catholic or Anglican funeral service. Black-Level events normally will end here. If a family gathering was planned to take place after the funeral, SCP-2852 will attend. SCP-2852 will, once all individuals affected have come to the location, vomit a similar mixture of blood, wood pulp, and dead Tibicen linnei into a bowl. This mixture will be primarily eaten by the affected children. After this has been eaten, SCP-2852 will give another speech of nonsensical words without patterns, strip itself, and lay upon a table. The participants, then, will eat SCP-2852's flesh until there is nothing left. During this, SCP-2852 will still vocalize, even when suffering from mortal injuries. Participants have been known to carry on friendly conversation with SCP-2852 while eating it. Children unable to chew whole food properly will be fed mouth-to-mouth by any caregivers. All participants of a Black-Level event will break from their family either through suicide, moving, or divorce. Every individual involved in an event will be rendered sterile. Domestic violence in participants of Black-Level events will usually be of a cannibalistic nature, resulting in the death of one or both individuals. Six out of ten children involved will attempt to murder one or both of their parents before they turn 18. It is theorized that nearly a third of Catholic and Anglican D-Class were involved in a Black-Level event. For further research regarding related phenomena, please see the database entry for SCP-3004.